Here's a list of frequently asked questions regarding J-Con in an attempt to help you out before the event! Q: Will I be able to buy J-Con Tickets on the day or do I have to pre-book? Q: Can I buy a Friday-Only ticket? A: If you wish to attend on the Friday night only, you don't need a ticket! You can simply pay on the door! The price for Friday Night only is £10. Q: Is there a cash point at Riverside? A: City 17 will be providing a cash point at the event. There is also a cash point just up the road. However, we still recommend you bring plenty of loose cash anyway as with any convention. Q: I'm disabled and require a carer to be with me at J-Con. How can you assist me? A: We'll happily provide your carer with a free pass for the event and send it with your ticket(s). The Riverside is very well catered for with regards to disabilities, with ramps, stair-lifts etc. 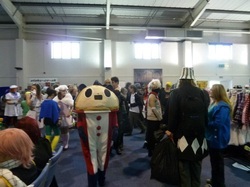 Q: Do I have to come in cosplay? Q: What are the prices on the Door? A: The prices on the Door are the same as buying online, minus the postage and fees cost. Currently this means: Friday only £10, Saturday only £15 and Two-Day £20. Q: Is there proper food available? A: There are several vendors selling good quality food. We offer as broad a range as possible and try to cater for specialist diets. However, we cannot guarantee this as it all depends on what vendors are able to attend J-Con. There are also several local Fast Food outlets nearby. Q: What time is J-Con? A: Friday: J-Con opens at 6.30pm and closes at 10.30pm. Saturday: J-Con opens at 9am for Fast Track Tickets and 10am for everyone else. J-Con closes at 6.30pm. A: Yes of course! There are tables and chairs to eat at near the food hatch so feel free. Q: Do children get in free? A: Under 12's get into J-Con free of charge! Under 14's must have an adult with them.